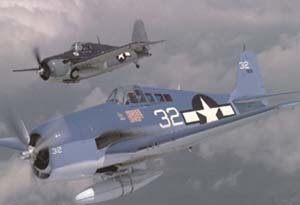 The Grumman F6F Hellcat and the Vought F4U Corsair were the primary USN carrier fighters in the second half of World War II. Armament consisted of the same six 0.5 in (12.7 mm) Browning machine guns with 400 rounds each, as later Grumman-built Wildcats; later aircraft gained three hardpoints to carry 1,000 lb (450 kg) bombs. It also had the greatest wing area of any World War II fighter with 334 square feet. The Hellcat was withdrawn from service shortly after the war's end. The last Hellcat rolled out in November 1945, the total production figure being 12,272, of which 11,000 had been built in just two years. The Hellcat was also used by the Royal Navy's Fleet Air Arm.